I can refine my techniques and ideas by practicing and documenting in a sketchbook. I can define, identify and use the elements and principles to create interesting compositions within my artwork. I can communicate ideas and emotions, solve problems, and document the world within artwork. I can create artwork using a variety of traditional media and techniques, including drawing, painting, collage, and printmaking. I can begin to develop and express my own style as an artist and preferences as a viewer of art and I understand that my personal experience, culture and history affect that. I can recognize and describe how history and culture affect the creation, meaning and interpretation of art objects. I can create artwork that is well crafted and of high quality. “What’s on your Mind?” self portrait collage . approx. 9×24 inches. collage and colored pencil. Students practiced creating self portraits with proper facial proportions and refined their drawing skills. They completed a final portrait filled with gradation and layering of colored pencils to create life-like skin tones. 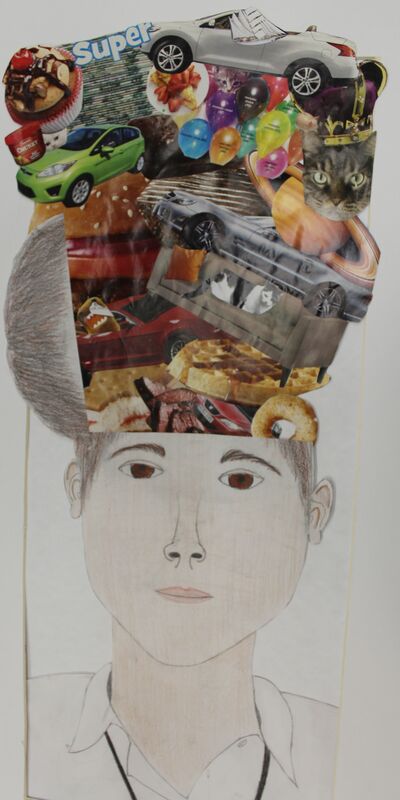 They added collage elements to further express their personal interests.